As election day approaches on November 4, Google is working with state and local election officials across the country to make voter information as widely available and as accurate as possible. Today, we announced a big step forward in that effort with the State of Ohio. Thanks to the leadership of Secretary of State Jennifer Brunner, Ohio is the first state to make comprehensive voting information available through our U.S. Voter Info Guide, a searchable database of election information powered by Google Search and Maps. 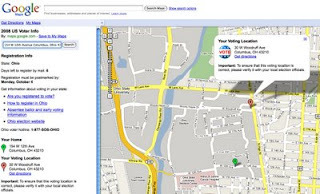 In addition, when voters in Ohio do a Google search for “where to vote” or “where to register," they will be directed to maps.google.com/vote, where they can enter their addresses and find registration information, absentee and early vote details, and their polling place. Our guide already includes voting locations for a number of states and the District of Columbia, and we are aiming to have voting information for all 50 states added by mid-October. We hope that this tool will equip voters with the information they need to make it to the polls on election day. Don't forget to vote! So can Google endorse Barack Obama outright? If not, why not?